The Lunt 60mm Solar Telescope provides the essential package that is perfect for a first time introduction to solar observing, while also offering the newest technology for fine tuning (Doppler True Tuning), allowing research of the Sun’s disk and every changing surface details. This instrument is highly adaptable for both visual and imaging use. Additional Upgrades and Accessories are available at additional cost. The price shown for an upgrade is the value of that upgrade over the base product and not the price of the upgrade product if purchased separately. 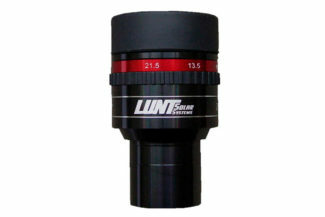 The Lunt 60mm Solar Telescope provides the basic essentials perfect for a first time introduction to solar observing, while also offering the newest technology for fine tuning (choose etalon tuning method in Tuner step), allowing basic research of the Sun’s disk and some surface details.